Happy Weekend! Hope your Summers are going well! This weekend, the girls and I were out in the garden, I found a new nursery, not far from my old favorite nursery that closed down. 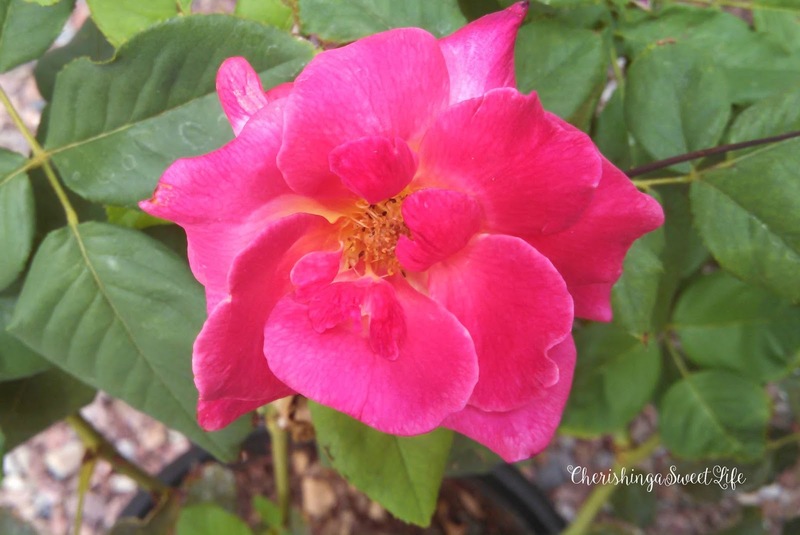 I was on a mission to find a rosebush. Afterwards the girls and I did some back to school shopping! Then today they helped me finish my daughter's dresser. Thank goodness my girls are artsy craftsy, because this art challenged momma needs all the help she can get. The story of my journey to that which we will call, What we learned about painting raw wood, you think my husband would have given me a few tips! Nah, I think he enjoys watching me struggle, or laughing at all my crazy antics! Also, I forgot to mention it was my niece's birthday this weekend. It's hard to believe she starts Kindergarten this year. So I spent last night with the family, and when there's a family get together, and my mom comes down from up North, she usually spends the day with me, and that's how this weekend turned out to busier than I expected! Here is the first bloom, from the first rose bush, in our new garden. Earlier this month, when I wanted to learn more about planting pumpkins in containers, I picked up a copy of 'Extreme Gardening' by "The Garden Guy", the local garden guru here in Phoenxi, Arizona. 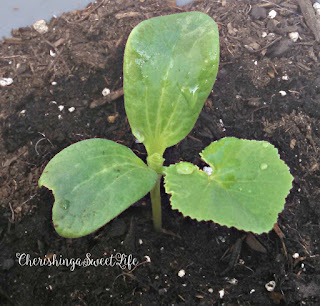 Other than my curious dogs, digging in the dirt and chewing on one of the baby pumpkin plants, so far out of 8 plants, 4 are growing just fine, and one is doing really well. Hopefully more to report on how they are doing soon. This is the last time, I promise I will talk about the weather here, and I am knocking on wood as we speak, but it has been a relatively mild Summer, except for the beginning with the two weeks of triple digits. With last week being somewhat enjoyable! Then there is the humidity, I've been wondering where the monsoons have gone. We really never got any rainstorms, like last years! With the somewhat cooler temperatures, I've been wanting to get out in the garden. It's the idea, that it isn't as hot as it normally is, and that what ever I plant, isn't going to burn up into a cloud of dust right before my eyes. 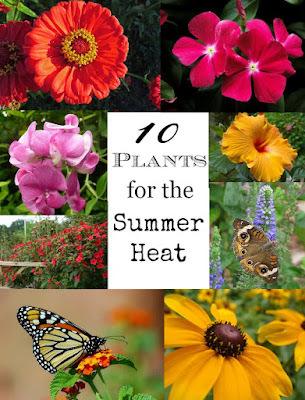 In my search for plants that are hardy and that really enjoy those extreme temperatures, I've found these 10 Plants that really enjoy the Summer Heat! My favorite varieties are, 'Blue Victoria' or 'Early Bonfire'. Warm Season Annual (Perennial in zones 8-10.) Blooms summer to late fall, and grow 18 inches tall. Plant in full sun. Spikes of deep purple-blue flowers cluster on dwarf stems. Typically Salvia blooms from July through October. This Texas and New Mexico native does well in hot and humid climates where it grows on dry hillsides. Also called Mealy Cup Sage. It needs well-drained soil that is slightly dry. It doesn't require any fertilization! 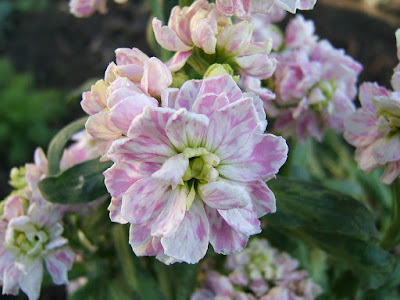 Looks best planted in groups in borders or other planting areas. Nice cut or dried flower, especially in winter bouquets. Cut spent flowers frequently to prolong bloom period. 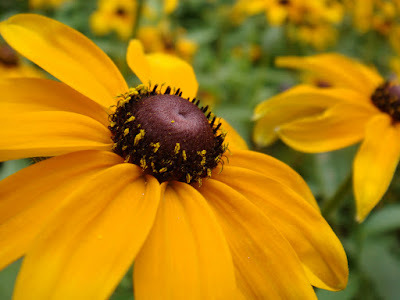 -Rudbeckia hirta - Perennial. Beautiful 2" - 4" daisylike flowers with orange/yellow petals. Blooms over a long period — at least 8 weeks. Black-Eyed Susan is a short-lived perennial which may come back for a second or third year, but is often treated as an annual. Re-seeds itself and can be used in “naturalized” wildflower areas, in other areas, it can become invasive. North America Native Wildflower. Attracts beneficial pollinators. 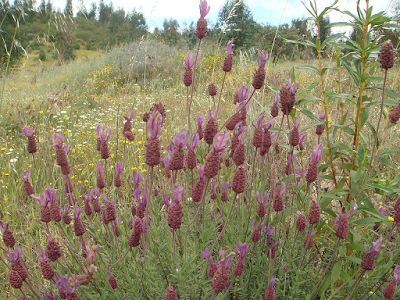 Lavendula pedunculata- It is native to many coastal regions of the Mediterranean, with some populations on the Atlantic coasts of Morocco and Spain. Spanish Lavender was most likely what the ancient Greeks and Romans used to scent their bath water. The word Lavender is derived from Latin lavare, meaning (to wash). Plant in September to March, in full sun. It needs adequate drainage. 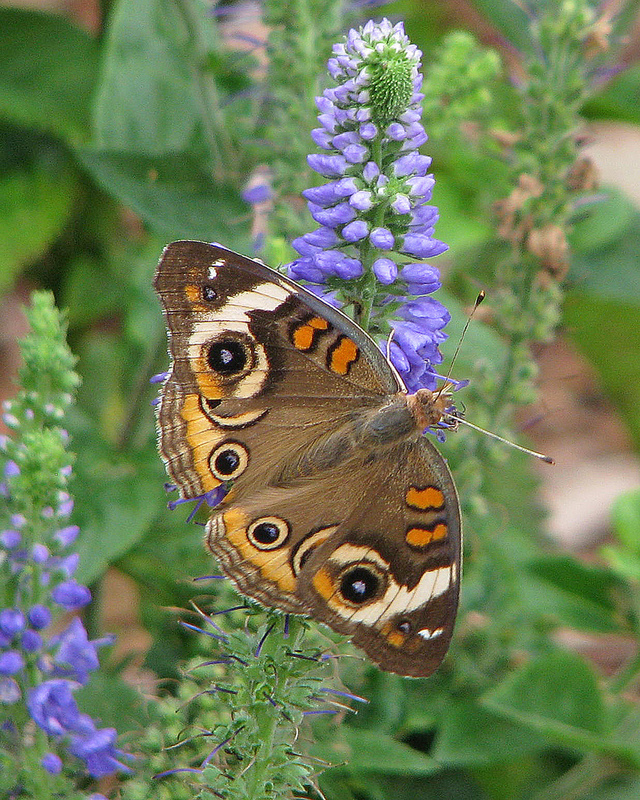 It is also a magnet for all kinds of beneficial pollinators, butterflies, and insects! 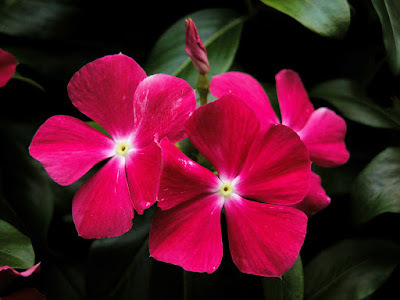 formally known as Vinca rosea, Now known as Catharanthus roseus or Madagascar Periwinkle. 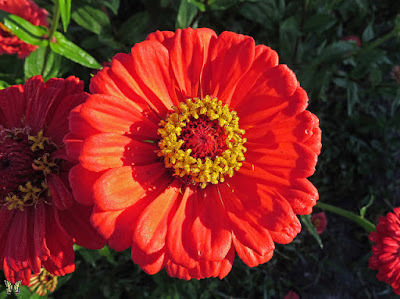 It's blooms create a sea of pinks, reds, cranberry and orange for a gorgeous bunch of vibrant color. The uniform, upright plants are covered with large, 1½ - 2" blossoms all summer long. Vinca performs amazing in hot, dry, sunny locations. It is also surprisingly forgiving if you forget to water it! The species has long been cultivated for herbal medicine and as an ornamental plant. In traditional Chinese medicine, extracts from it have been used against numerous diseases, including diabetes, malaria, and Hodgkin's lymphoma. Many of the vinca alkaloids were first isolated from Catharanthus roseus. 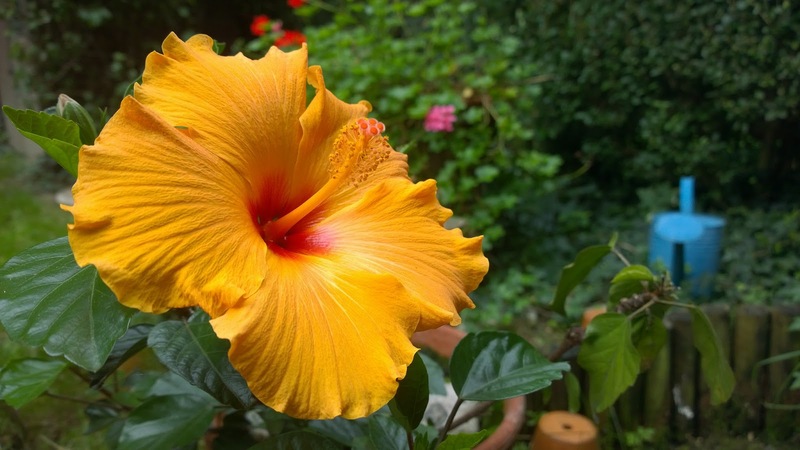 The substances vinblastine and vincristine extracted from the plant are used in the treatment of leukemia  and Hodgkin's lymphoma. Lantana camera - Perennial. Plant in full sun with good drainage from mid-February through September. 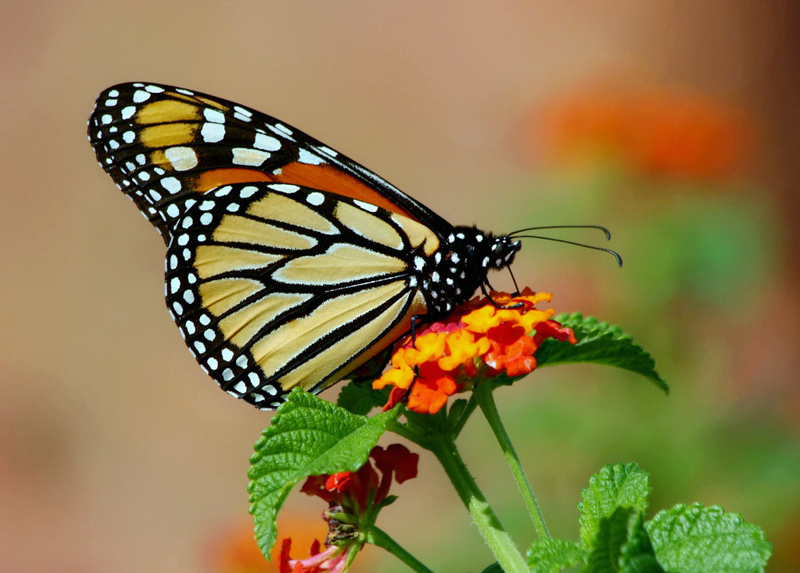 It attracts butterflies, like the Monarch, as well as hummingbirds. It is also toxic to livestock and animals, horses, dogs, and goats. Growing them here in Arizona, I have found them to be very hardy plants. They die back with the first frost, but come back to life in the Spring. They love the heat, and do fine with very little water. The more you water them, the bigger and brighter they get. Annual. Plant from Mid- March to Mid-July. Endless vibrant color, the more you cut them the more they grow. Use them in gorgeous cut flower bouquets. They attract beneficial pollinators and insects. Matthiola incana- Annual. Sow seeds in fall for winter bloom, stock prefers cooler temperatures. It has a heavenly, sweet/spicy fragrance. This is one of my favorites. My husband even commented, on a gorgeous bouquet of Stock and Snapdragons, I had on my table, how incredibly delicious smelling they were. Lahyrus odoratus- Annual. 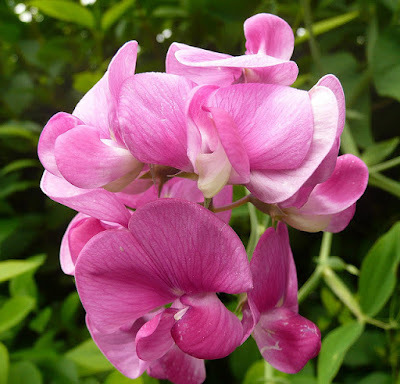 The Sweet Pea is poisonous. They may look like pea pods, but are not meant for food consumption. Sow seeds in the beginning of October to the beginning of March. Their seeds can not only be easily saved for next season, but they also reseed themselves as well. Most varieties require a trellis for support for their twining vines. Do not plant with members of the onion family. Sweet Peas attract beneficial pollinators. They have a sweet heavenly fragrance, in beautiful shades of blue, pink. white, lavender, purple, rose, salmon and maroon, as well as bi-colors. Here is a list of the Royal Horticultural Society Award of Garden Merit. They were discovered growing wild in Sicily in the late 1600s. The Italian heritage varieties have a very good heat tolerance. One such variety is ‘Cupani’, one of the original wild sweet peas, found on a Sicilian roadside by Father, Francis Cupani, an Italian monk who sent it's seeds back to England in the 17th century. Sweet Peas have been popular with gardeners since being first hybridized in 1723. 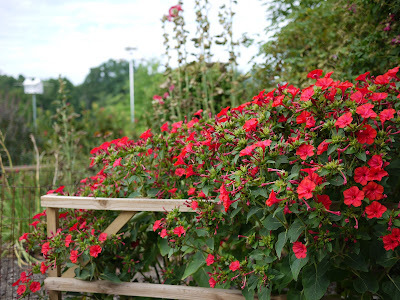 Rosa-sinensis - Known also as Rose Mallow, is a perennial shrub, that is planted mid-February through April. While it enjoys the heat, it also likes afternoon shade in a non-tropical climate, such as the low desert. It can grow 5 to 6 feet and does require an adequate amount of water. Mirabilis jalapa- Appropriately named for its characteristic of blooming around 4PM with fragrant blooms, four o’clock grows and flowers almost anywhere including hot, windy areas. They can be grown into excellent annual hedges. Plant 4 o' clocks in Full Sun, ( it loves the heat), from seed about mid-September to April. It easily reseeds itself. They make wonderful container plants, as well. It is a curious plant, as different colored flowers can be on the same plant, as flowers, can also be patterned with stripes and flecks. Most information found on Wikipedia, or here on Amazon from (affiliate link) Botanical Interests ! All of these are so gorgeous! You know, I haven't thought about 4 o'clocks in years! As kids, we used to pick those black beads out and throw them at each other! :-) Hugs!! Wow! You did have a busy weekend. Black eyed Susans are a favorite flower of mine...they were my Grandma's favorite! 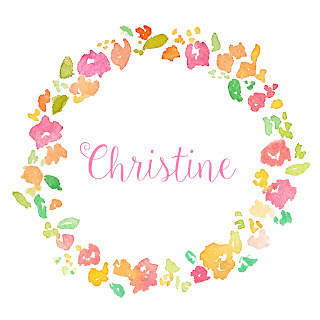 Hi Christine. What gorgeous flowers. I wanted to let you know that I featured you this week at our Cooking and Crafting with J & J! Thanks and hope you can link up again with us.